Many people, very powerful people, are not happy with what and whom my whistleblower case exposed, including but not limited to venture capitalists and agencies within the United States government. As a result we’ll hear and see abusive people, who do not want the negative truth expose, try and manipulate the facts, then insult & demean and finally threaten & intimidate me into silence. It hasn’t worked in five years and it’s not going to now. The reason I made the unprecedented decision start a website, writing under my own name while still under federal seal, that according to Assistant Attorney General of The United States Department of Justice Sara Bloom, “did not break the seal but the spirit of the seal,” was to hold both sides accountable to the people. Two known corrupt entities with a pathological history of public abuse, The United States Government and Johnson & Johnson negotiating behind closed door on behalf of the American people did not sit well with me. The U.S. Government likes to believe they represent the people, they do not, the whistleblower defends the people and the DOJ defends the case, which they wouldn’t have known about without people coming forward. It’s not enough just to expose the problem, it’s important to also be part of the solution. 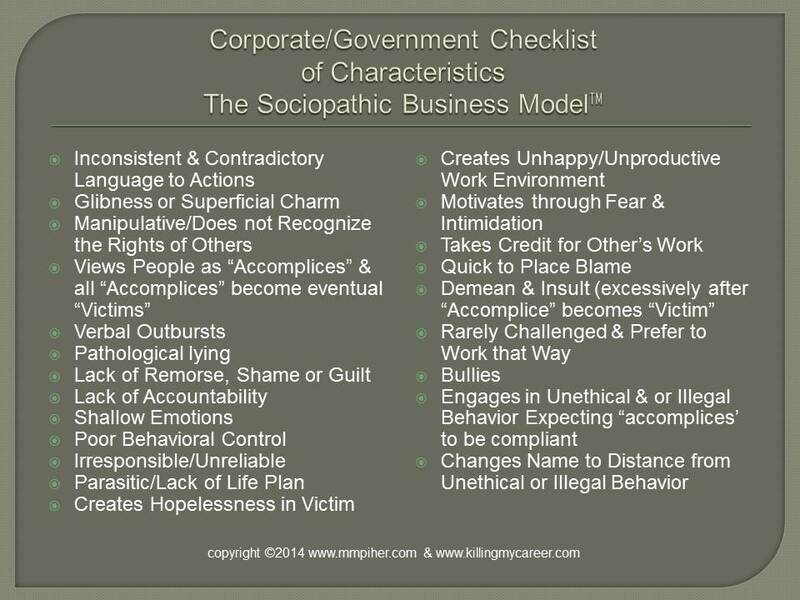 In the simplest of terms, there are both good & bad or (Abusive & Non-Abusive) in every organization from established companies to startups; and, even the government, which The Sociopathic Business Model™ also views as a company. 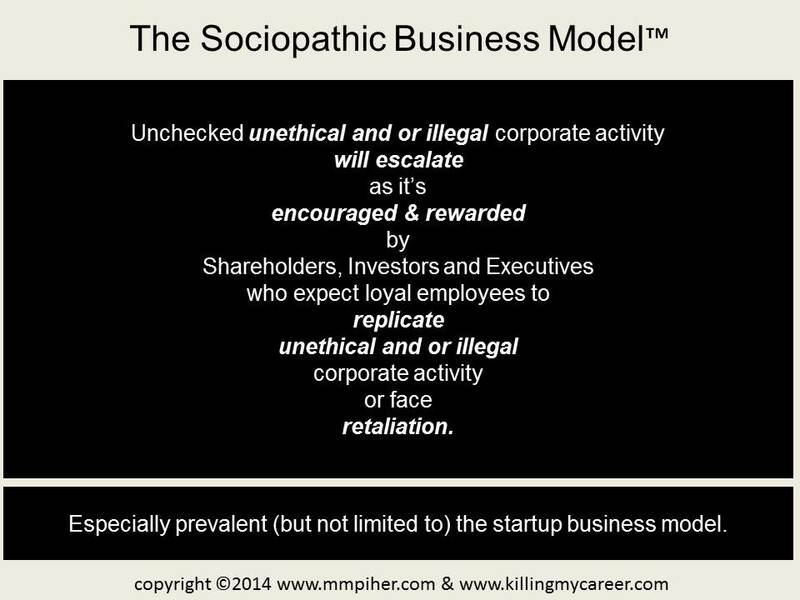 The goal is to expose, remove, and force accountability on the Abusive (unethical) as means to discourage the replication of harmful fraud while encouraging, replicating and rewarding the Non-Abusive (ethical) who are accountable to employees, consumers, patients, shareholders, and taxpayers, known as The MMpiHer Method™, where profits and ethics don’t have to be a choice, companies can be both profitable and ethical. *Also, in very simple terms: Facts are the enemy of fraud. 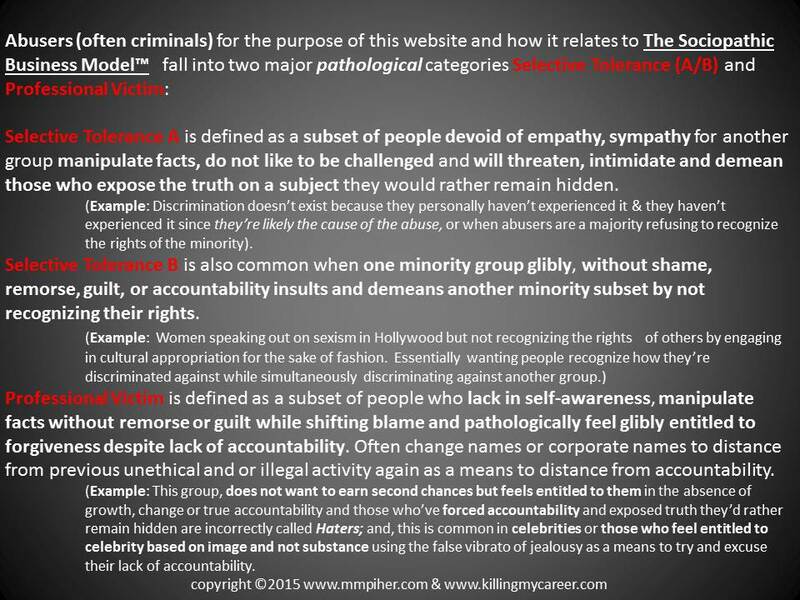 If you are a person with a history of abusive behavior towards others, you will not agree with the information on this site because it threatens to expose the truth about your own unethical and or illegal behavior towards others. You will gain nothing from this site, nor will you be given the opportunity to abuse others as a means to protect the negative truth. If you are uncomfortable seeing yourself as a victim of abuse as either an employee, consumer, patient, shareholder or taxpayer, then you’re in the right place, if you’re willing to reframe your thinking as a means to create positive change and protect yourself further corporate abuse. The lies we tell ourselves are always far worse than the ones told to us by others. True self-awareness and honesty are required. Multiple Subcategories: All subcategories are just adjectives that help describe the category of either Abusive or Non-Abusive. 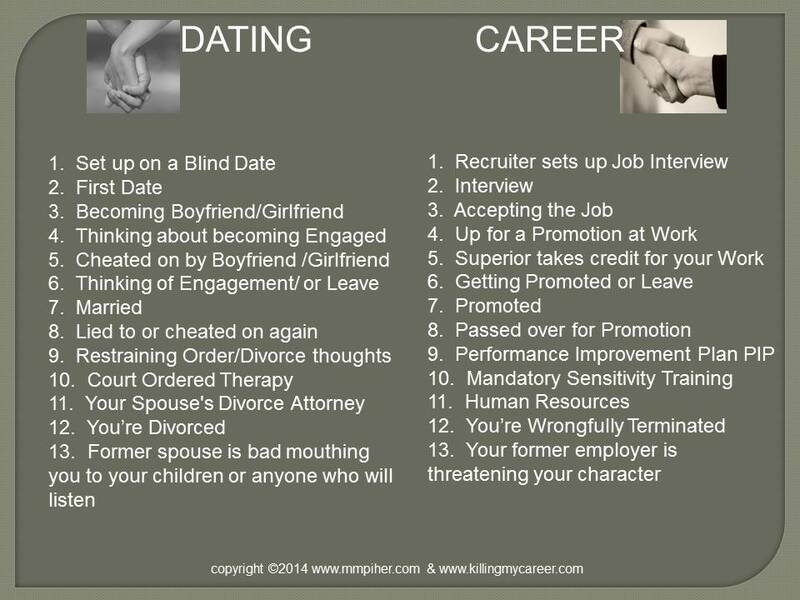 Victims of job loss not related to skill but due to corporate fraud abuse and mismanagement. Victims of SEC violations due to corporate fraud and mismanagement. Victims of corporate fraud forced to pay for crimes they did not commit. Innocent until proven guilty is for the courts; and, a misappropriated phrase used by abusive who expect immediate unearned forgiveness without accountability while continually placing blame. There’s also a lot of not-yet-convicted felons running companies who will always put their profits before everyone else’s safety unless they’re forced accountable. Taxpayers each group has to help the other in order to get the media’s attention. abuse victim of company fraudulently filing employee taxes to reflect better to investors at employee expense for three years, despite IRS warnings to the company. First time in U.S. History a venture capital-funded, incubated, startup medical device company fraudulently, knowingly & willingly lied to obtained the 510 (k) from FDA. Which is different than just off-label promotion. Off-label means the device works as it’s approved, in addition to other ways. It was not known when selling the device that it did not work as it was fraudulently approved and as it was designed to be sold, with a steroid injected into the device. Venture Capital funded, incubated startup which sold to a conglomerate fraudulently, knowingly & willingly profited twice off a product that never worked. First time in U.S. History a venture capital funded, incubated startup, sold to conglomerate employee whistleblower, using her own name, wrote and spoke out publically while under seal. I will work with people but never for them again, a subtle but necessary distinction. 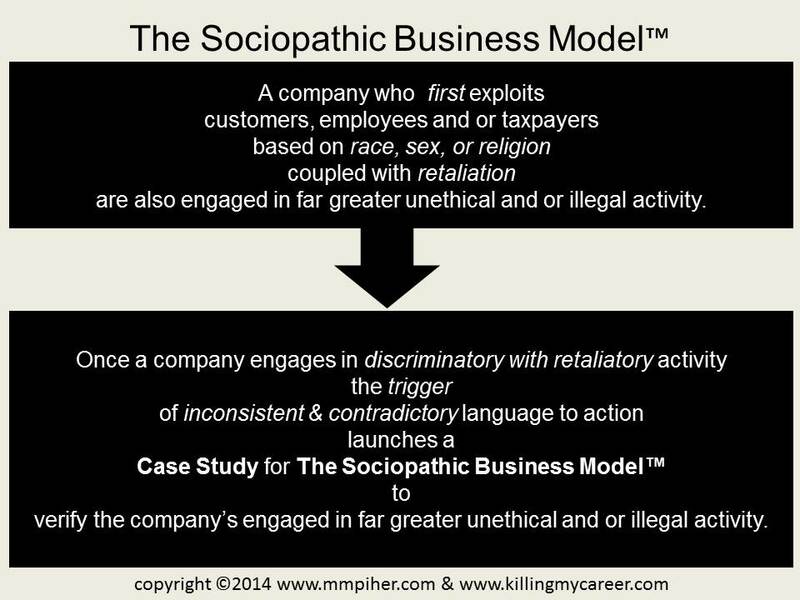 The Sociopathic Business Model™ through Case Studies on Killing My Career, across industries, and through my own personal account as a whistleblower, proves that previously undetected pathological patterns in venture capital-funded startup fraud, where boards, founders and executives knowingly, willingly, and purposely manipulate facts without shame, remorse, guilt, accountability or without regard for law when generating quotas based on false projections, designed to give the false appearance of hypergrowth to achieve a fraudulent company valuation for the goal of making 7-10x’s the amount of their initial investment for the IPO or sale of the company to a conglomerate. This is fraud. Having identified the problem it’s equally important to recognize and support those who are part of the solution. Social Activism Marketing to bring awareness to worthy cause’s time has come; and, society tired of fraud the hopelessness it creates has the ability to hold both big business and big government accountable like never before with social media and those who help orchestrate it , like Jane Akre. Change truly can start with one person who can enlist the help of many. My experience, as I’ve said is much bigger than me; and, prompted the creation of my own company to work with (not for-a subtle yet necessary distinction) to hold those responsible for fraud accountable while being part of the solution through positive change. MMpiHer Method™ (pronounced Empire), is a three month sales, marketing and management program designed to increase your company’s accountability, productivity, marketability and profitability—ethically. In short, nobody wins until everybody wins, which is also the company motto. MmpiHer Method’s™ proprietary system, working with your entire team, determines the necessary changes (first month), helps to fully implement those changes (second month), and provides the necessary tools for your team to become self-sufficient while successfully replicating the process (third month). Our team is a resource for life, and the quarterly tune ups, will help your team quickly identify, and fix potential weaknesses before they become problems. *Results from hard data and or independent anonymous employee survey from large medical provider group multiple offices muliple providers. Recognizes the importance of properly training managers. Addresses, reduces and prevents the high cost of employee turnover. 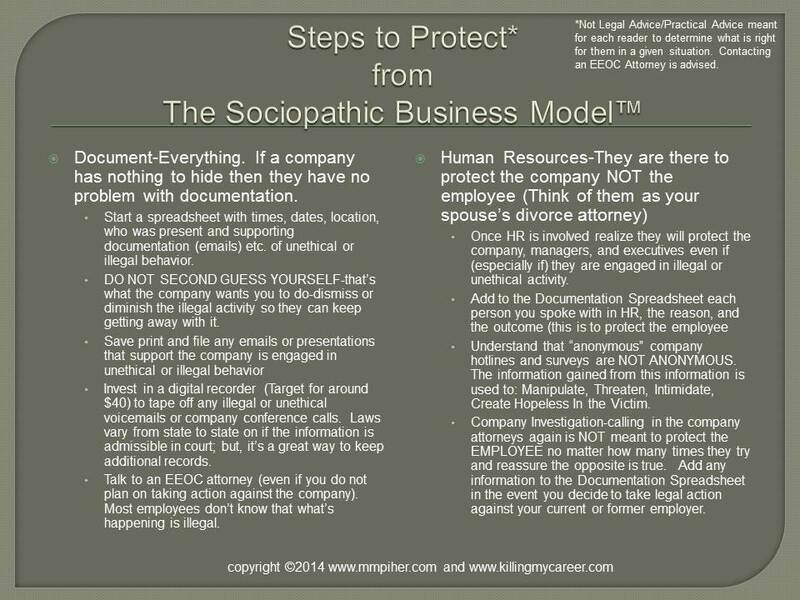 Reduces and eventually eliminates negative or illegal behavior within the company. The design of the program protects, both employees and employers by adding mutual increased accountability, ethically. Continually and quickly incorporates changes while testing the website during each phase of the three month build. This process ensures all areas of the business will be able to support the website, quickly adapt to changes, and identify and fix problems as they arise. Proprietary program quickly identifies areas of profit growth, while uniquely engaging all employees for implementation; and providing the necessary tools to replicate successfully. All content included on this site, such as text, graphics, logos, button icons, images, data compilations, is the property of Killing My Career and requires prior written consent to copy, distribute, retransmit, or modify information or materials on this site, whether in electronic or hard copy form, without the express prior written permission of Killing My Career, it is strictly prohibited.